The brewing device, offered in extremely fashionable finish (copper, black matte, polished steel), utilizes a super functional design to bring your brewing into the next level. The clever device allows you to enjoy a more intuitive and steady pour with Stagg's precision gooseneck pour spout. Its weighted handle allows for more control over the flow and direction of your pour like a true coffee connoisseur. You can pour at an even, slow, and controlled pace with the counterbalanced handle with moves the center of mass towards your hand for a more accurate pour. 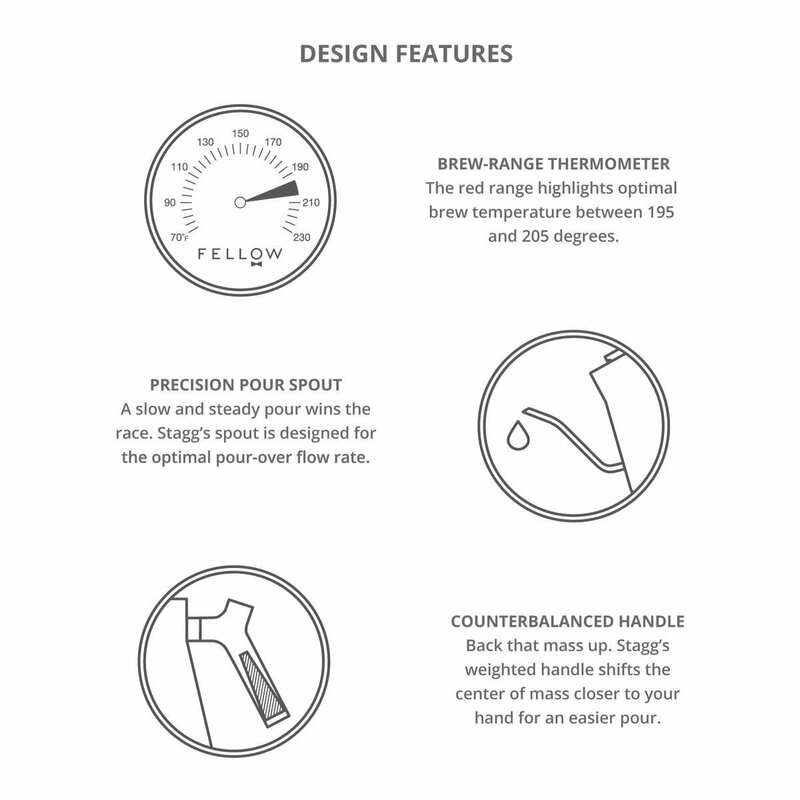 The Stagg Stovetop Gooseneck Kettle also includes an integrated thermometer on the lid which makes its easy to gauge the temperature of brews when precision and accuracy is of utmost importance to the optimal cup. You'll never have to guess whether your coffee is at the right temperature again. The thermometer's red zone indicates the optimal coffee brewing temperature between 194 and 205 degrees going up to 203 degrees for tea. The pour-over kettle can hold up to a liter of water which is enough to brew up seven five-ounce cups of coffee or tea. While its design is both cutting edge and intriguing, making it a covetable object for any modern kitchen. 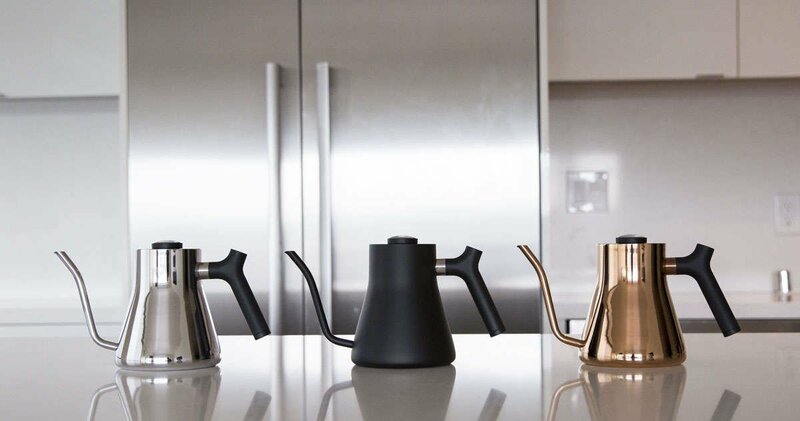 The kettle features an attractive symmetry from the spout to the handle in a design that follows both form and function. In an ultra trendy and fashionable finish (copper, black matte, polished steel), the kettle is well suited to be a focal point of your home. The Stagg Stovetop Pour-Over Kettle also features a newly designed stainless steel lid that is both durable and stylish. The Fellow Stagg's innovative packaging also features a "Pour Over Perfected" guide which helps users understand the right coffee to water ratios to create the ultimate pour over. 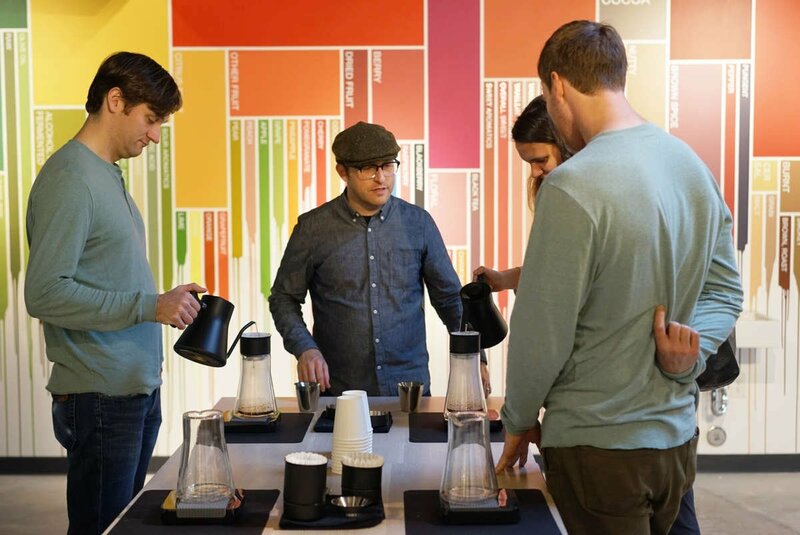 Newly interested baristas can get started on their favorite brews from the moment they open the kettle's box. The Stagg's built-in thermometer takes the guesswork out of brewing delicious coffee or tea. 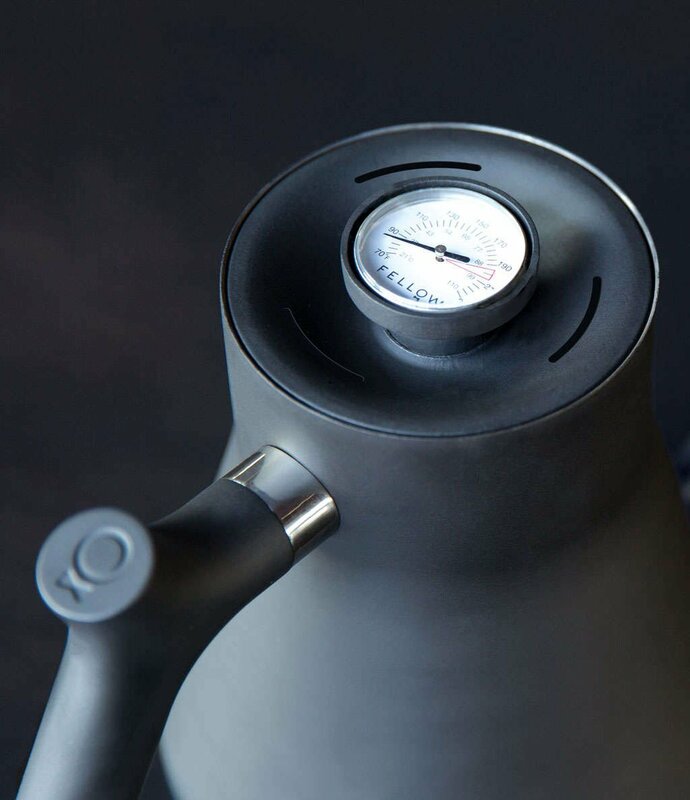 The kettle's lid contains a thermometer which accurately reads temperatures to indicate the optimal amount of heat for your favorite beverage. You never have to worry about over or under brewing again. The Stagg Stovetop Pour-Over features a precise gooseneck pour spout so you can pour at an even, controlled, and slow pace serving up optimal brews with accuracy without spilling or splashing. Its weighted handle allows for more control over the flow and direction of your coffee or tea. 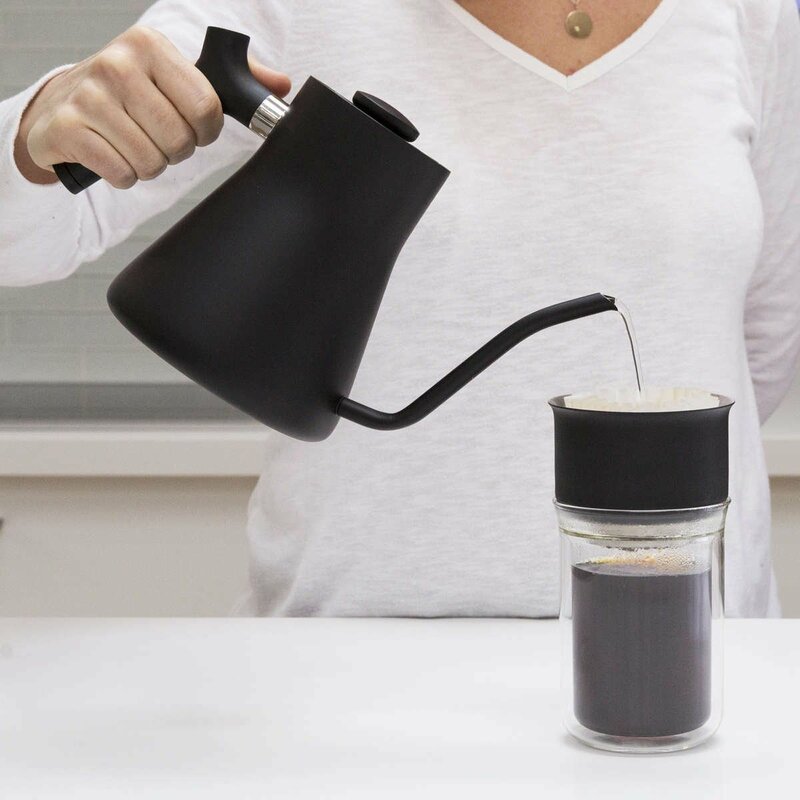 The Fellow Stagg can hold up to a liter of water which can accommodate seven five-ounce cups of coffee or tea. You only need to heat up one pot to enjoy a caffeine pick-me-up throughout the day. Or use its large capacity to brew up morning coffees for your entire family. The Stagg is not only ergonomically designed to be weighted right in your hand, it also features an ultra stylish silhouette and modern design. Its bold silhouette looks elegant in even the most modern of kitchens, while its very trendy finish - copper, black matte, polished steel - is the metal of the moment. The kettle's robust design and high-quality materials ensure that it is easy to care for and will also stand the test of time. The kettle is compatible on a variety of ranges making it easy to use wherever you are.